This singletrack trail includes tight turns over a humped prairie with some sections winding thru the trees. This is mostly a beginner level trail suitable for both mountain bikes, cyclocross riding, and push bikes, however, some tight turns may be difficult for newer riders. Novice bypasses are included for the more technical sections. 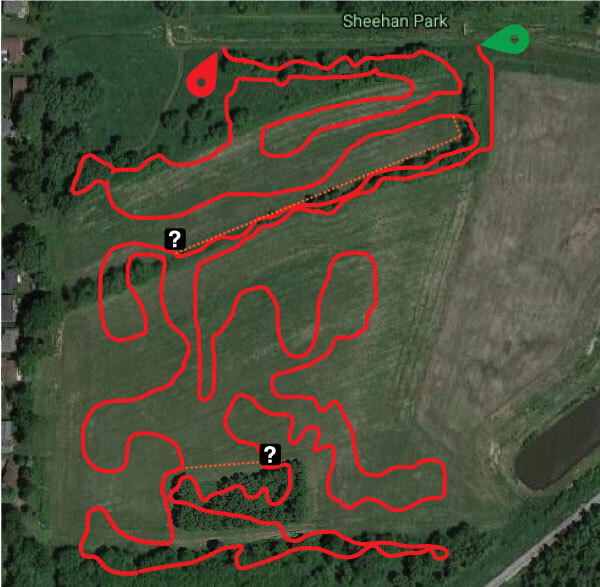 The trails are located on the south side of Sheehan Park which offers numerous amenities for families. There are places along the trail which retain water. With this in mind, do not ride on them for the first few hours after a rain event and if your tires are leaving ruts or depressions in the turf the area is considered closed to riding. Riding during these wet conditions can damage the trails and expedite erosion. The trail is accessible via the south side of Sheehan Park. We recommend parking in the lot near the baseball fields and skate park off of S. Ball St, though you could park in any of the park lots and ride over. From the south parking lot, follow the dirt/grass trail over to the start of the loop.